The Justice Department is investigating whether US airlines have colluded to keep prices high. In a statement, the department confirmed an Associated Press report it was looking into "possible unlawful co-ordination by some airlines". AP reported that it had seen a document revealing that the Justice Department had requested information from airlines as part of a competition probe. It follows years of restructuring and mergers by US airlines. Since the onset of the financial crisis in 2008, major carriers such as American, United and Delta, along with a host of regional airlines, have overhauled operations and stemmed heavy losses. AP said the Justice Department was investigating whether airlines were now conspiring to grow slowly in order to keep ticket prices high. By limiting the number of routes and available seats, airlines could charge higher prices. The report did not name which airlines had been asked for information by the Justice Department. It is thought that investigators have requested all communications the airlines had with each other, Wall Street analysts and major shareholders about their plans for passenger-carrying capacity. Last month, the International Air Transport Association revised up its profit forecast for US airlines. 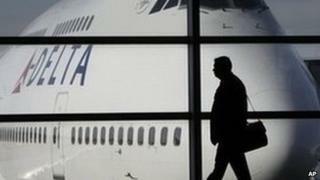 IATA said it expected carriers to make profits of $15.7bn (£10bn) this year, up from the $13.2bn predicted in December. Falling fuel prices have assisted the growth. News of the Justice Department investigation hit airline shares, with American Airlines and United Continental Holdings both down 2.4%. The Dow Jones airline index fell almost 4% in early trading. The Justice Department, which investigates mergers to assess whether they violate antitrust law, has approved a string of airline deals. Most recently, US Airways merged with American Airlines in 2013, United bought Continental in 2012, Southwest bought Airtran in 2011 and Delta purchased Northwest in 2008.